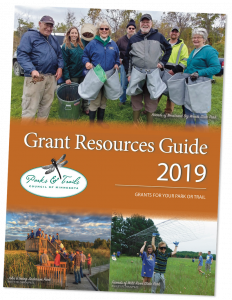 Find funding for your Minnesota park or trail by perusing the 2019 Grant Resources Guide. Each year, Parks & Trails Council gathers information about grant programs that friends groups may be interested in applying for directly or in supporting a public land agency in their application. This grant guide highlights funding opportunities that are designed to support acquisition, development, construction, renovation, and activation of parks and trails. Please note that if you are a fiscal client of Parks & Trails Council, you need to notify us if you plan to apply for a grant. You can do that by submitting a quick, online form that highlights the basics about the application. Then, P&TC can identify if there are any potential conflicts with pursuing that grant funding. You can find the form by going to the Fiscal Client Resources page, scrolling to the “General Fiscal Client Documents” heading, and clicking the online form button under the “Grant Notification” tab.